There is no denying that a good waterproof walking jacket is essential to enjoying a good time in the British countryside. My Berghaus Ridgemaster arrived just in time for what feels like the wettest few months in years. This winter has bought rain, snow, more rain and then a bit more snow. All this bad weather has given me the perfect chance to test out my new jacket. I do get a bit excited when a parcel arrives in the post for me. I’m not someone who can put it to one side and wait until later to open it. I was particularly excited about receiving my jacket as my last waterproof was, well, no longer waterproof! The Ridgemaster comes in three different colours, blue, pink or black. Blue was the obvious choice as it’s my favourite colour. The jacket is two tone and I feel the brighter blue is important for safety when out on the hills. Of course, I put it on straight away and immediately loved the fit. To be honest I was looking forward to it raining so I could try it out. I didn’t have to wait long. Brew Dog and I head out for a walk twice a day whatever the weather. We were soon out on a rainy morning and the jacket showed its toughness in no time. The Ridgemaster is one of Berghaus’s more robust jacket, made of Gore-Tex fabric and with storm level protection. That showed well, with the rain drops sitting on the surface and running off easily. It is also fully breathable and the elbows have been designed to have great movement. The big test came a couple of weeks later, when the Beast from the East hit. Snowstorms meant the safest way to get to work was to walk. This time it was more the wind than wet which could have affected my warmth but again the jacket came into its own. The wind proof material and taped seams meant I stayed snug throughout, whilst the peaked hood kept the snowflakes out of my eyes. The Peak District has been the jackets toughest test. Two trips in the last couple of months have both bought more snowstorms and I have been happy and comfortable in the jacket each time. I have also been putting the large, inner map pocket to good use. It’s not just handy for maps, it’s also a good place to keep my phone warm and dry so the battery doesn’t drain in the cold weather. Would I recommend the Berghaus Ridgemaster? Absolutely, yes. It’s not too bulky and fits easily into your backpack. It’s smart and lots of people have commented on the fit and style. 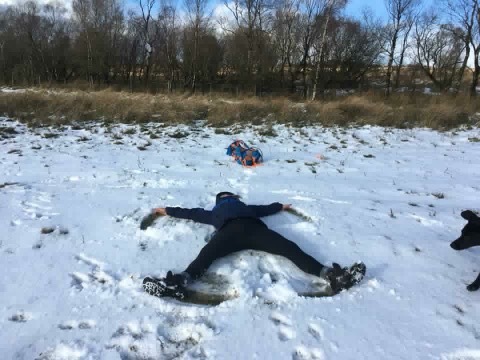 Best of all, I will happily lie down in the snow and make snow angels in it – that’s got to be a good endorsement! Check out the Ridgemaster and the rest of the Berghaus range here. Next Post Can We Positively Choose Our Luck?